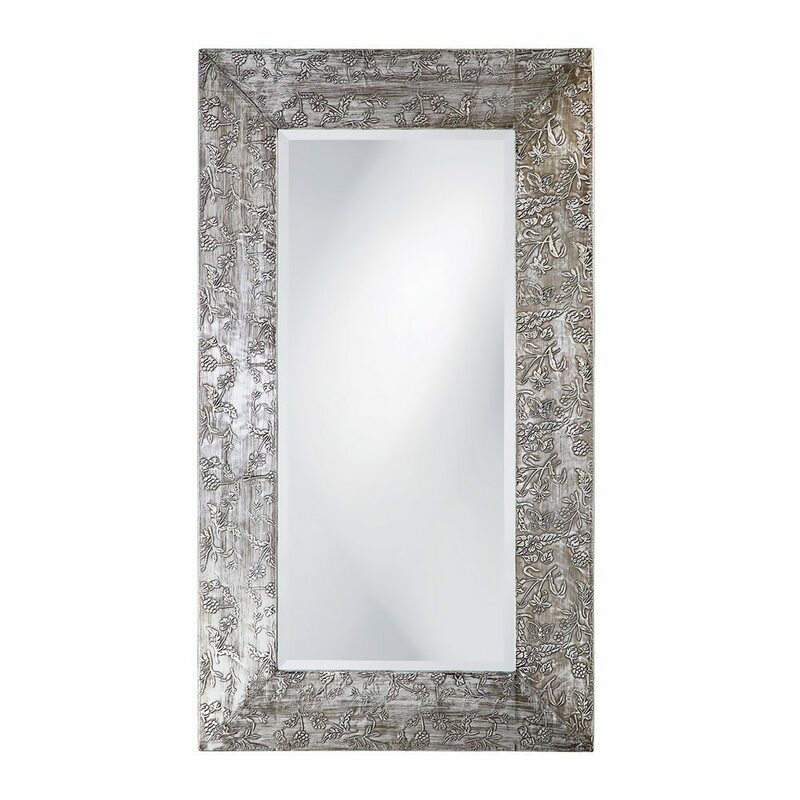 Replicate the romantic luster of a framed antique silver mirror using aluminum foil and mod podge to create faux embossed, silver-leafed finish. 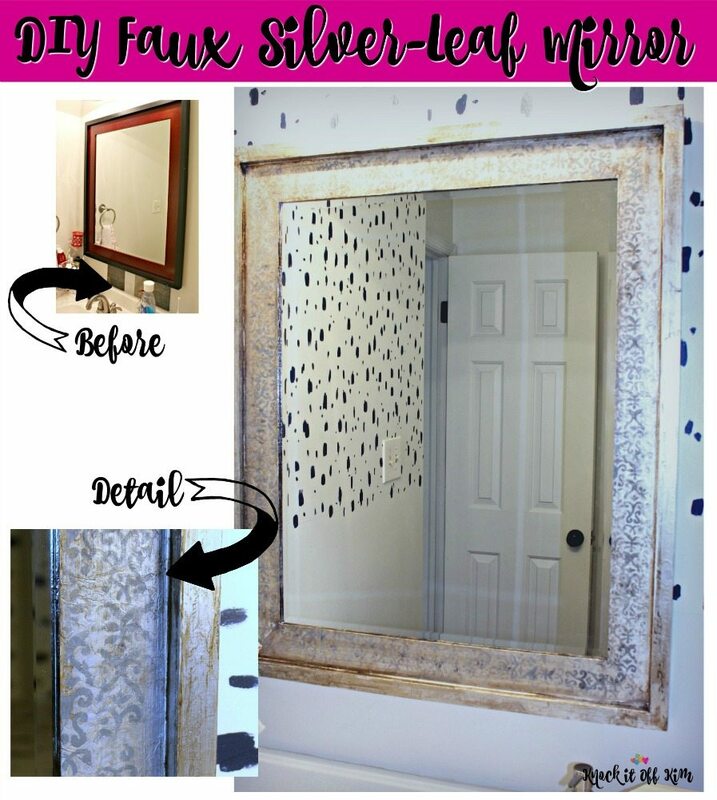 One of the projects I wanted to tackle during my attempts to update my powder room through the $100 Room Challenge was to give this mirror a makeover. Although the finish was fine as it was, it didn’t add anything to modern design I was going with. 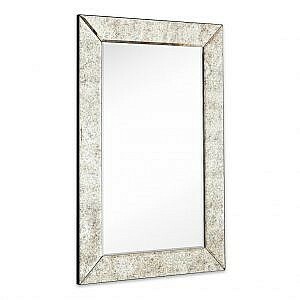 This is how the mirror looked when I started – not terrible but not in-line with the look I was trying to achieve in the new bathroom! 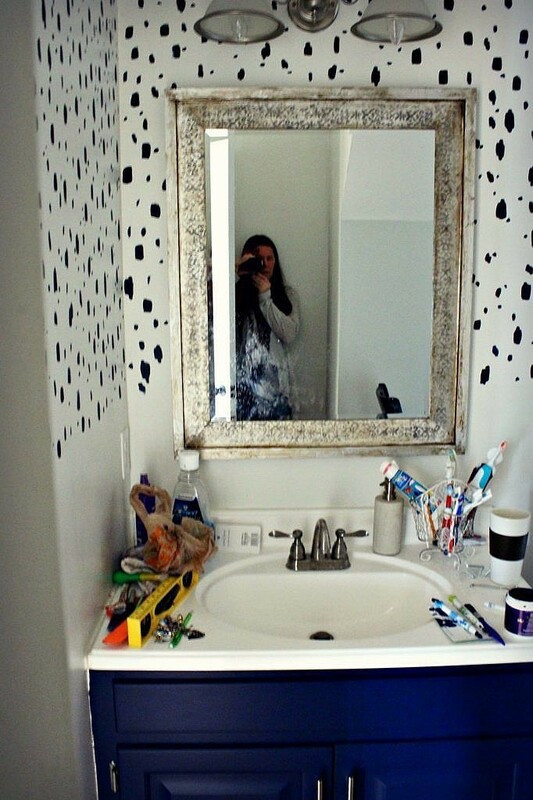 I was more interested in it looking like this, but buying a new mirror wasn’t in the budget, which made it a perfect time for an inexpensive DIY. 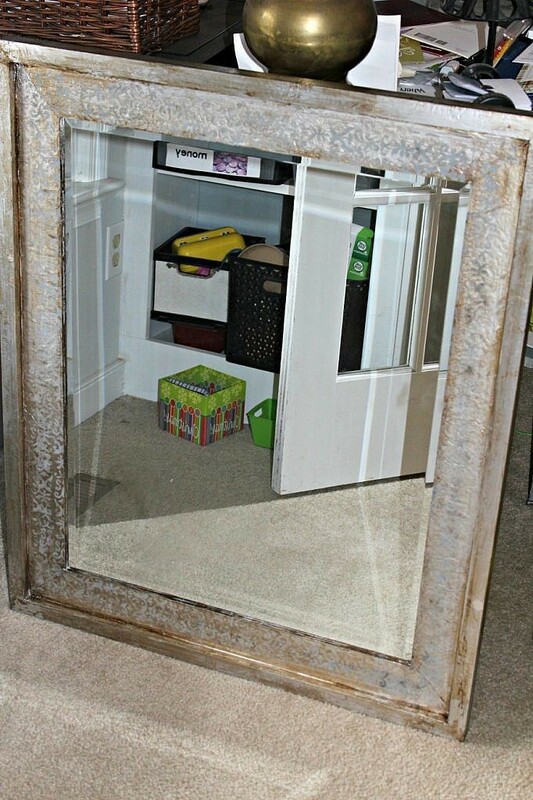 Step 1: Remove the mirror from the frame. 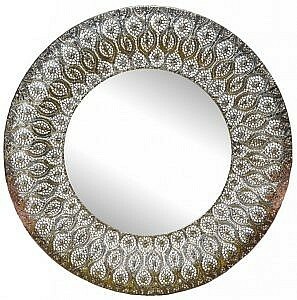 This was a little bit tricky, but we used an Exacto knife to cut away the existing glue.. be careful not to remove any of the mirror finish. Step 2: Cut the foil into strips. I did this using a ruler. 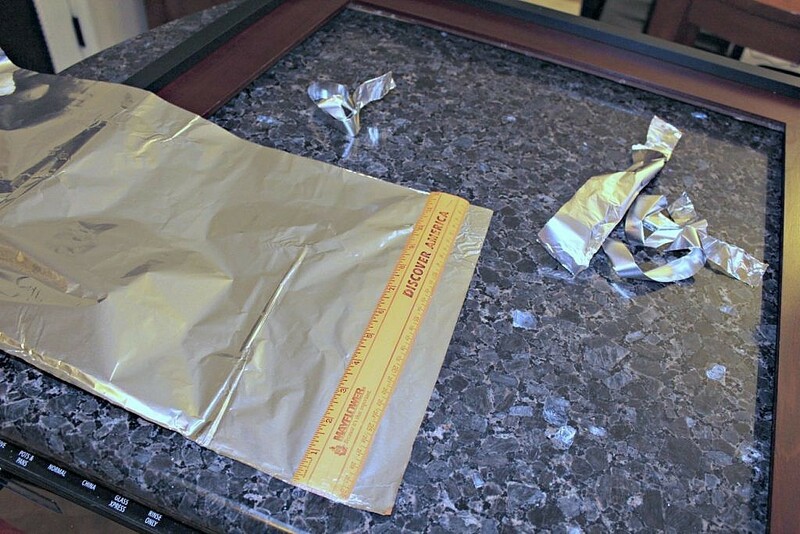 Lay the ruler flat onto a piece of foil, bend the ruler over the ruler and tear down along the edge of the ruler. 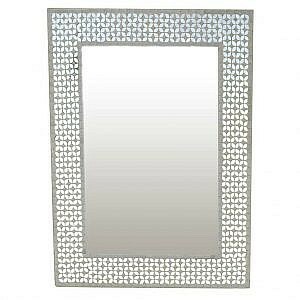 You’ll want more than you’ll think you need – I cut about 50 square feet of foil for this mirror – and you’ll want them to be about 1″ wide. Don’t worry if they aren’t exact. 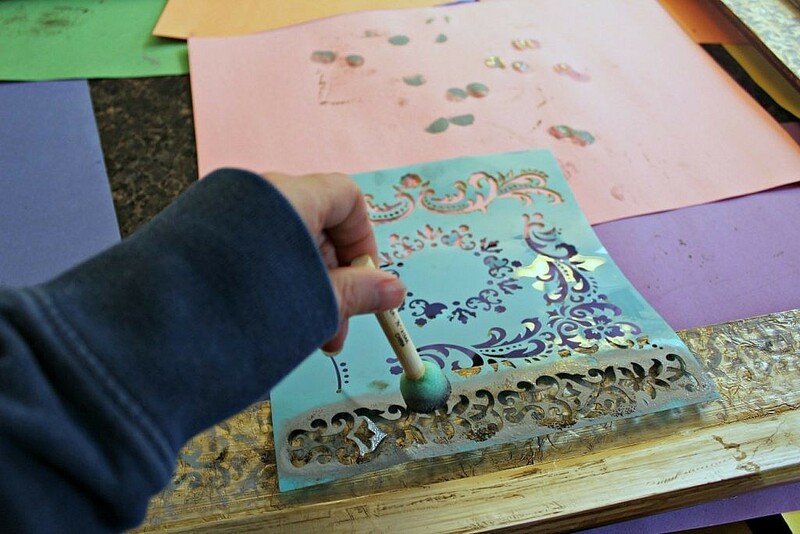 Step 3: Working on a small section at a time, brush the wallpaper paste onto the frame and begin to apply strips of foil, smoothing them with the smoothing tool by gently applying pressure while running it over the foil with the edge. Be careful to remove any air bubbles. I put the foil shiny-side down, but either side will work. Continue to apply pieces to the surface, covering the entire surface, overlapping edges and smoothing with the smoother. Let dry then gently wash off any excess paste. You’ll be surprised at how resilient the foil finish is! 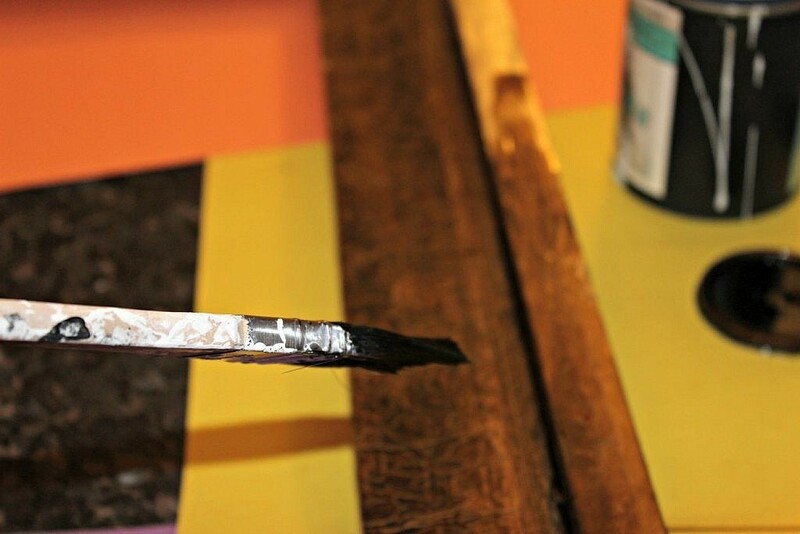 Step 4: With a lint-free cloth or paint brush apply a coat of stain onto the foiled surface, working in a circular motion as though it were a glaze and remove any excess. 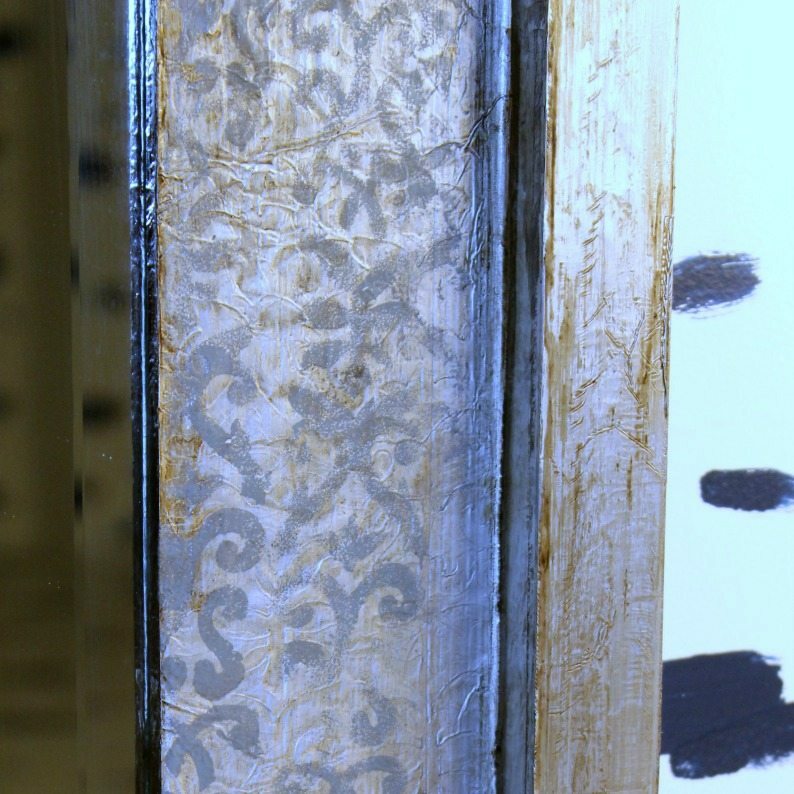 You want to work the paint into the crevices, folds, and cracks of the foil which will give it an aged and textured look. 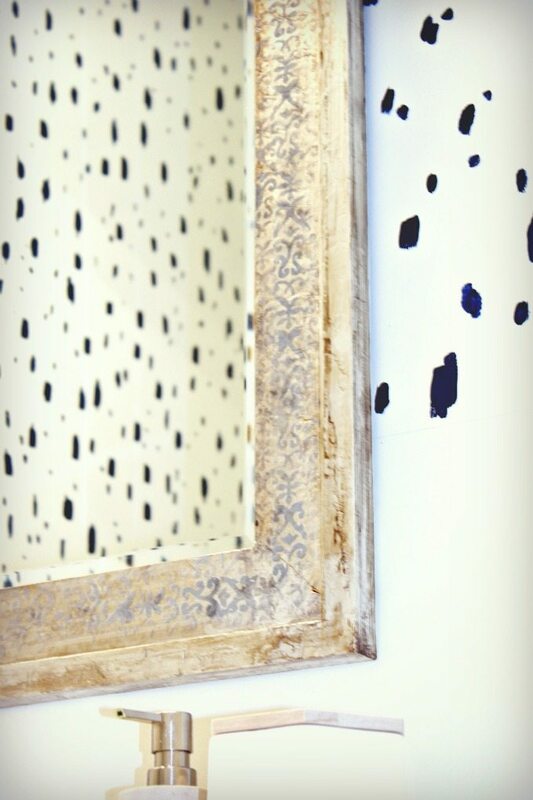 The foil will NOT absorb the stain as it would on wood but it will provide a beautiful patina and will dry if you do a thin enough coat. 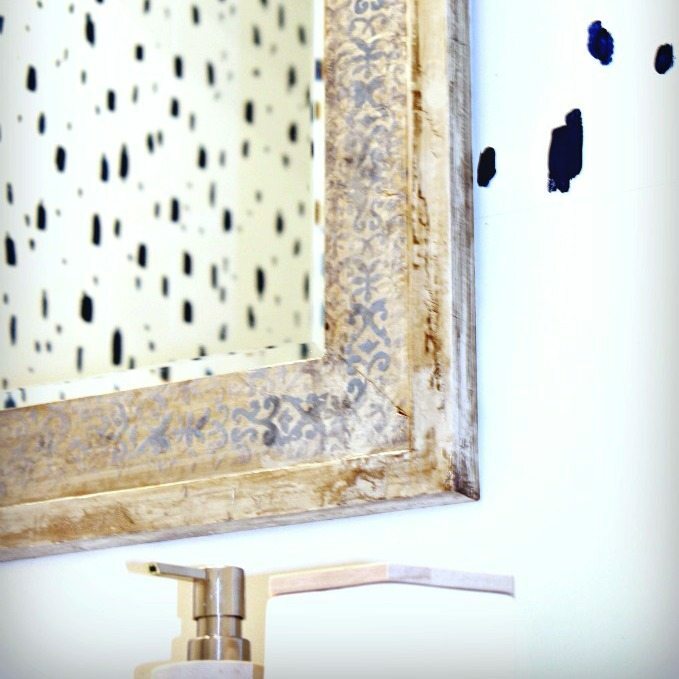 If you put the stain on too thickly just remove it with a cloth and reapply where necessary. Let dry. Step 5: I had used the larger pattern of the stencil set on my daughter’s upholstered headboard, but I wanted something more delicate for the mirror and used a much smaller banner style stencil from the stencil set instead. I didn’t worry too much about lining up the placement and sometimes overlapped the pattern to fill in space. You want it to look like stamped metal. 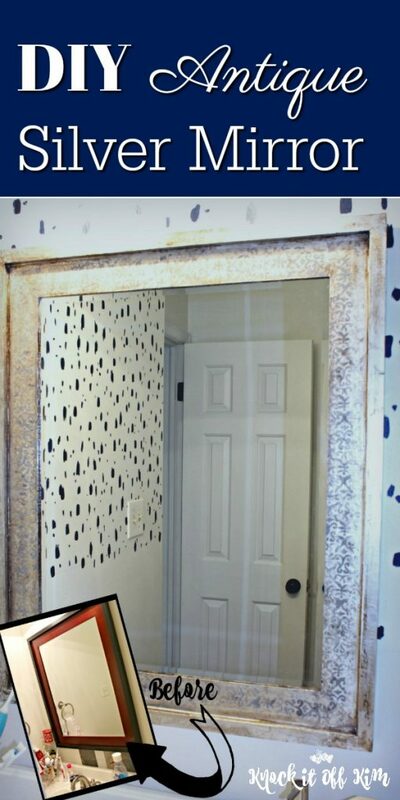 Using a small amount of paint, apply the stencil pattern with the dark gray paint along the edge of the mirror. 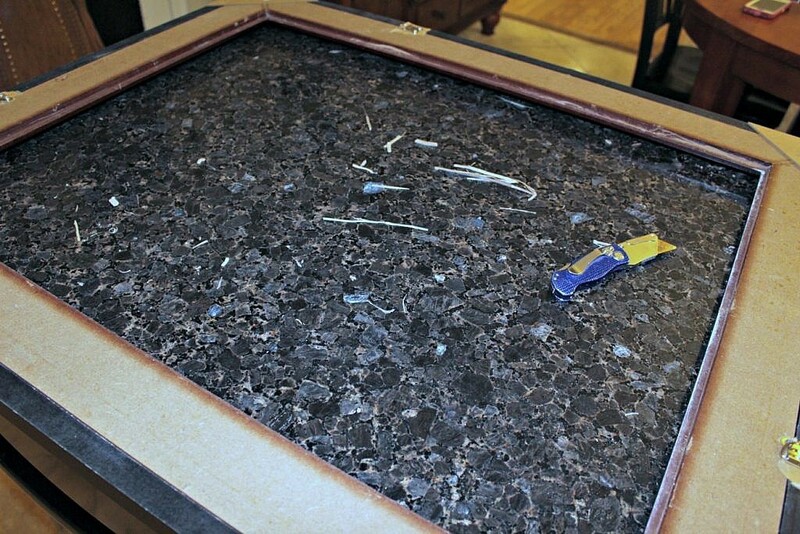 Step 6: Apply the polyacrylic with a brush, being VERY careful not to remove the finish from the paint or stencil. I used two coats, letting them dry in between. 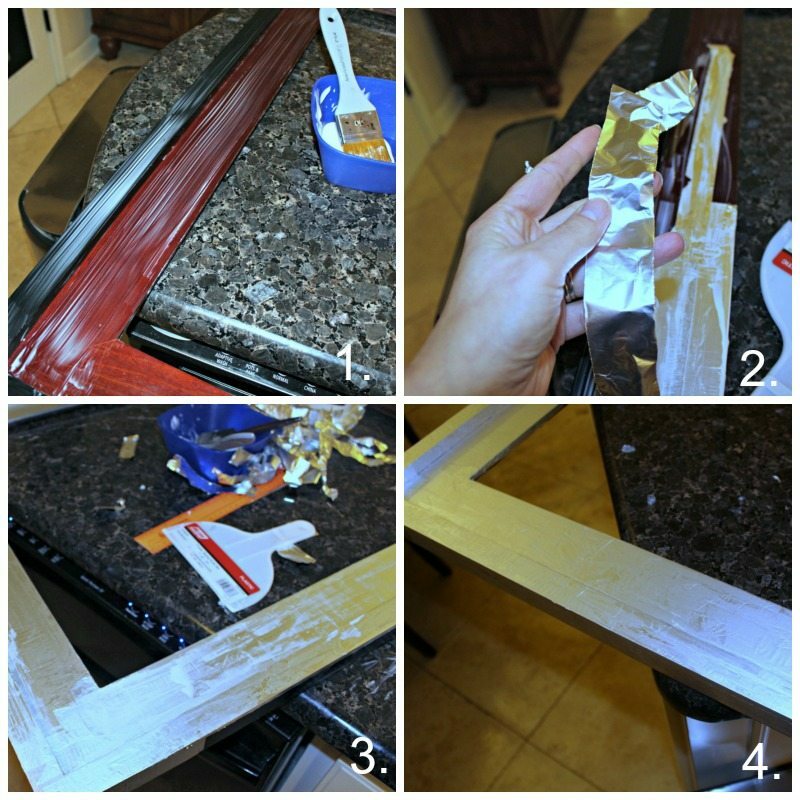 Step 7: Insert your mirror back into the frame and apply hot glue around the edge of the mirror at the back, concentrating on the corners. 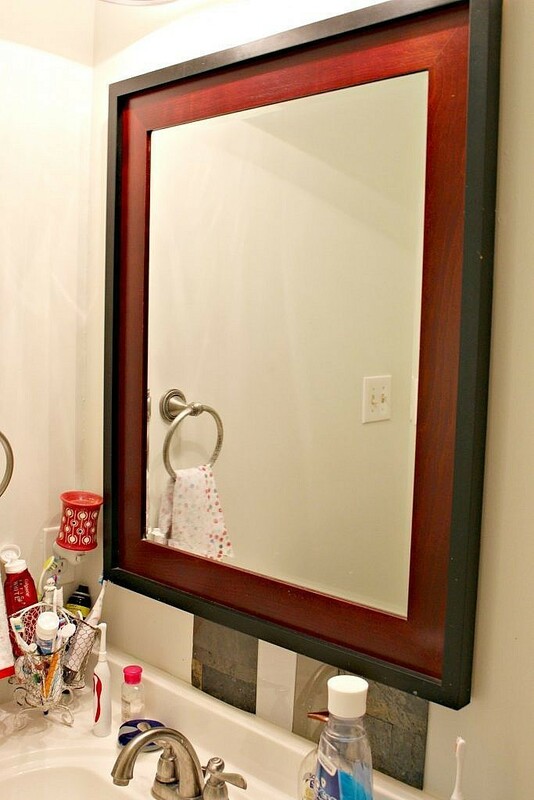 Step 8: Hang your finished mirror, then pat yourself on the back, stand back and admire all of your hard work! Although there are a lot of steps, this is a relatively straightforward project that yields fantastic results for next to nothing. If you do try this on your own, please, send me a picture of your finished project, I’d love to see! 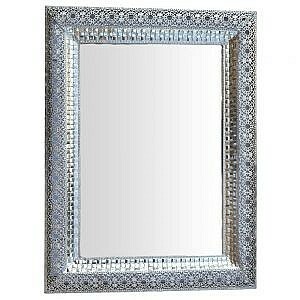 Rather buy than DIY? Here are some alternatives to Doing-it-yourself! I had SO much fun with this project, and I couldn’t be more thrilled with the outcome. How about you? 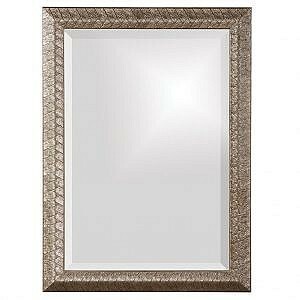 Are you ready for a new look for your bathroom mirror? Wow, what a great technique! 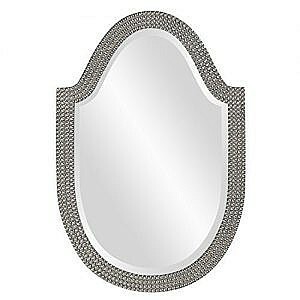 I will definitely be looking at thrift mirrors differently now!!! Love your creativity!